EYCE is pleased to share with you an official presentation of “Cut the Prejudice” video documentary. The video has been realized behind the scenes of an interreligious event held in Berlin and offers the participants personal contribution about the interreligious prejudice eradication. 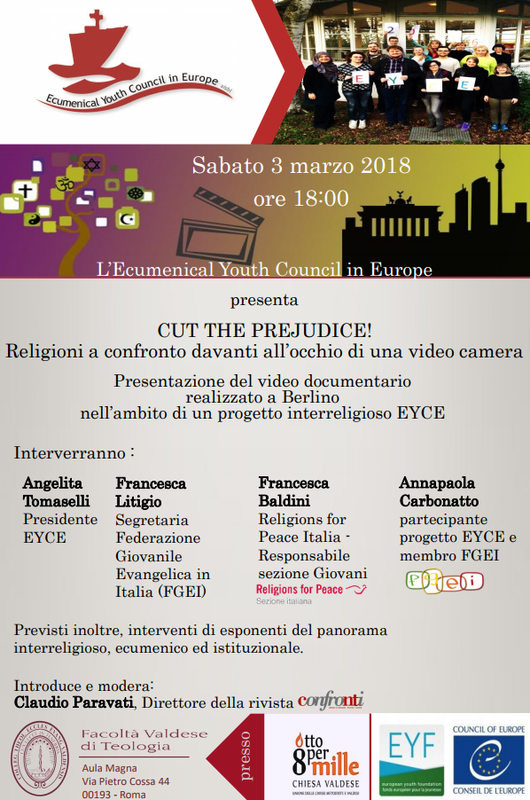 The event, in cooperation with EYCE Italian Member Organisation FGEI, will take place in Rome at the Waldensian Faculty of Theology on the 3rd of March at 18 pm CET. Together with video projection, a space for a debate will be offered. Institutional and religious representatives have been invited. This is also a good chance to talk about EYCE and to contribute in the field of interreligious dialogue.